California Solar Panel Installers Insurance. Renewable energy is becoming more accessible to businesses and homeowners. Solar panels are one of the easiest renewable designs to implement. Other than their green status, they contribute to significant monetary savings. A growing demand for solar power has made it possible for many contractors to expand their businesses or start a new one. Business owners need to remain aware of the specific dangers of any installation activity. The solar power business model opens up some new California solar panel installers insurance coverage necessities for contractor businesses to consider. California solar panel installers insurance protects your business from lawsuits with rates as low as $97/mo. Get a fast quote and your certificate of insurance now. Starting January 1st, 2020, virtually all new homes built in California will be equipped with solar panels due to a newly passed bill by The California Energy Commission on May 9, 2018 - requiring new homes in CA to be built with solar panels. This means solar power contractors will be getting a lot more business int the coming years, and havign the right insurance will be even more important as their businesses grow. What Is Solar Panel Installers Insurance? A solar power installation business leaves CA contractors with several different coverage aspects to consider. Equipment, transportation, and workers must be insured properly. Solar installations entail a wide range of responsibilities. Your workers need to be protected from injury costs. Equipment and function also need to be addressed by your insurance company. Solar panels in buildings can have some complications after installation. The panels and damage to the building should also be covered. A thorough conversation with an insurance broker can help you make sure that every situation possible is covered under your new policy. Equipment floater coverage is an important part of making sure the supplies do not cause a loss on the way to the job site. Solar panels are covered by this part of the policy from the time they are loaded up for transit until after the job is successfully completed. Many types of damage are covered by this. This includes storm damage, theft, and fire. Damage from vandalism is also covered. If anything happens during the installation, replacements are guaranteed. This is incredibly important due to the size and expense of solar panels. An event as simple as a wreck on the highway could completely destroy the materials. Also there have been many cases of expensive inverters being stolen from jobsites. Bodily Injury - Physical harm to a person at your place of business, or an injury caused by your employee at a client's site - like leaving tools on the jobsite and someone trips and falls and gets hurt. Completed Operations/Products Liability - Claims after your business has completed work for a customer - such as a panel blows off a roof in a windstorm. Personal Injury - Damage to the reputation or rights of a person or business due to slander, libel, copyright infringement, invasion or privacy, false arrest, wrongful eviction, etc. Advertising Injury - Losses caused by your advertising (spoken or written); for example, an ad that trashes a competitor. Medical Payments - Pays first dollar medical expenses (think PIP in auto) of a person injured on your premises like a customer, client or visitor, regardless of fault. Mold is often excluded from various types of insurance policies. The damages can be extensive and costly when mold is involved. Inhabitants of the affected building could also suffer physical harm, as mold can cause health issues. The same goes for California solar panel installers insurance policies. There are, however, some policies that offer optional coverage for future mold damage in CA buildings where solar panels have been installed. Water leakage is one of the most common complications, resulting from installation mishaps. Construction lawsuits can be long and expensive. If your company offers a mold coverage option, it is best to take advantage of it. Professional liability (errors & omissions) has to do with the design and engineering aspect of a solar project. Each project is different, depending on the details of the building or needs of the customer. Once a design is approved and implemented, any issues that arise are covered by the professional liability portion. Rebates and tax incentives are also included in this coverage. Workers can incur a myriad of injuries when installing solar panels. The most serious injuries can result from working on roofs. The combination of height and heavy equipment can dangerous. While many safety precautions are taken on most job sites, accidents still happen sometimes. Workers comp is required by most businesses with non-owner employees in most states, according to laws. This part of a solar policy meets the same standards as it does in all business applications. Accidental injuries that happen while on the job are potentially covered by workers compensation. There is usually a strict approval process, however. Medical costs and lost wages are covered by this part of the policy once all other possible liabilities are ruled out. CA solar power installers need to be properly covered, just like any other business. Their work does present the possibility of some unique issues, however. Leaks from faulty sealants can cause water damage. This can, in turn, result in mold exposure. Proper coverage covers your work, even after the job is complete. Equipment, however, is only covered until the job is complete. Equipment coverage takes care of the solar panels and supporting materials from the time they are loaded on the transport vehicle. CA Solar power installers insurance is a lot like average business coverage, with a few tweaks and other optional features. 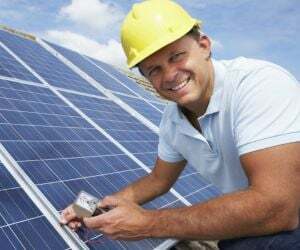 Request a free California Solar Panel Installers Insurance quote in Alameda, Alhambra, Anaheim, Antioch, Apple Valley, Bakersfield, Baldwin Park, Bellflower, Berkeley, Buena Park, Burbank, Camarillo, Carlsbad, Carson, Chico, Chino Hills, Chino, Chula Vista, Citrus Heights, Clovis, Compton, Concord, Corona, Costa Mesa, Daly City, Davis, Downey, El Cajon, El Monte, Elk Grove, Escondido, Fairfield, Folsom, Fontana, Fremont, Fresno, Fullerton, Garden Grove, Glendale, Hawthorne, Hayward, Hemet, Hesperia, Huntington Beach, Indio, Inglewood, Irvine, Lake Forest, Lakewood, Lancaster, Livermore, Long Beach, Los Angeles, Lynwood, Manteca, Menifee, Merced, Milpitas, Mission Viejo, Modesto, Moreno Valley, Mountain View, Murrieta, Napa, Newport Beach, Norwalk, Oakland, Oceanside, Ontario, Orange, Oxnard, Palmdale, Palo Alto, Pasadena, Perris, Pleasanton, Pomona, Rancho Cordova, Rancho Cucamonga, Redding, Redlands, Redondo Beach, Redwood City, Rialto, Richmond, Riverside, Roseville, Sacramento, Salinas, San Bernardino, San Buenaventura, San Diego, San Francisco, San Jose, San Leandro, San Marcos, San Mateo, San Ramon, Santa Ana, Santa Barbara, Santa Clara, Santa Clarita, Santa Maria, Santa Monica, Santa Rosa, Simi Valley, South Gate, Stockton, Sunnyvale, Temecula, Thousand Oaks, Torrance, Tracy, Turlock, Tustin, Union City, Upland, Vacaville, Vallejo, Victorville, Visalia, Vista, Walnut Creek, West Covina, Westminster, Whittier, Yorba Linda, Yuba City and all other cities in CA - The Golden State.